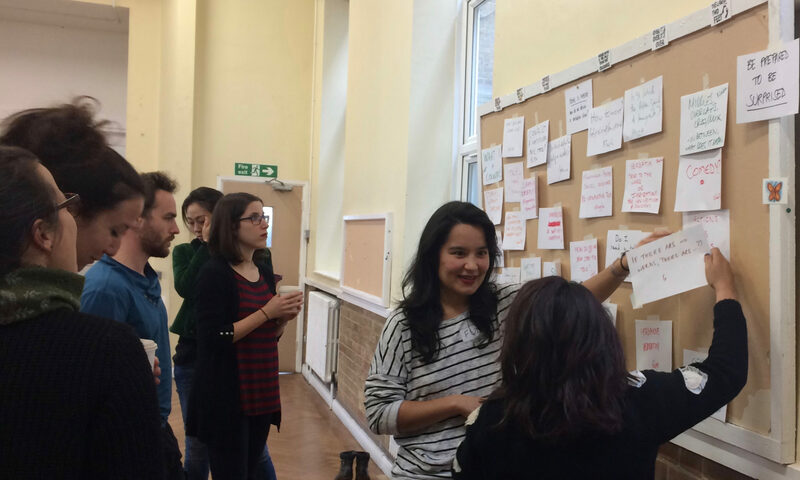 At D&D 9 in January 2014, an annual open space conference of theatremakers, I called a session on Third Culture Kids (TCKs) and verbatim theatre, hoping to find some candidates for interviews and get started making a piece. More than a dozen people responded to my invitation, others who had grown up in a mix of different cultures and created their own unique “Third Culture” out of many influences. At that session, I found a deep and instant connection among fellow artists with complex identities. An honest and gleeful sharing of personal histories. A reunion of strangers. Or re-born, perhaps I should say. I have long been fascinated with Third Culture stories, and the themes of home, identity, and belonging that they bring up. In 2006-2007, I studied “abroad” at the University of Manchester, looking for answers about my cultural heritage. I interviewed my family and wrote a “one-woman play for five actors” that I called Hyphenated. I was looking for some way to reconcile my Britishness with my Americanness, trying to figure out which one was “the real me,” wrestling with the invisibility of my hyphen, the privilege and identity crisis that comes with it. Here’s my story. My parents met in Leeds, where they were at high school together. Family legend has it they fell in love at 16, painting a house together. My mum washed paint out of my dad’s hair with turpentine – the punch line is he’s now mostly bald. I spent the first four years of my life in Hazel Grove, Stockport, where my parents lived in the 1980s after my dad graduated from the University of Manchester. When I was five, we moved to California. I was pretty keen to fit in, as most kids are. I went to school and learned to spell the American way. I insisted we have Thanksgiving dinner like the other kids in my class (the first year, we had turkey meatloaf in a tent trailer on a Northern California camp site). I don’t remember when I adopted an American accent. I don’t remember when I stopped asking when we were moving back. I graduated from a California high school and then a California university. I returned to San Francisco to pursue theatre. No one ever knew I wasn’t American unless I told them. I always felt my Englishness tucked away somewhere safe – not hidden, but not shouted from the rooftops (that would be very un-English, wouldn’t it?). It was my love of puns, my aversion to spicy foods, my inability to get a tan. And deeper things too, those can’t-quite-put-your-finger-on-it moments of identifying with a nation of people 6,000 miles away. My Englishness was never a secret, more like a little piece of treasure that I would show only to people I trusted. Here we are, about to get on the plane to California in 1990. In July 2013, I moved to London. And discovered how American I am. Like, really American. No one would ever know I’m actually from here unless I told them. When I submitted my 2007 version of Hyphenated to the University of California (where it probably still sits, unread, among other undergraduate thesis projects), I knew I wasn’t done with this idea. Writing the play didn’t put to rest my identity crisis. Where’s home? Where do I belong? What does that even mean? Why does my accent change depending on who I’m talking to? Am I English enough? Am I American enough? How can I be both? It’s about Ilayda Arden, Sharlit Deyzac, Susie Italiano, Guleraana Mir, and Natasha Phillips – fellow TCK artists convened at D&D 9 who became my collaborators for this newHyphenated. It’s about their stories, and my story, and the stories we’re about to find. It’s about belonging together. Hyphenated will begin as a viral storytelling project: a series of interview chains and an online oral history library. From this raw material, we will create a verbatim performance that we hope to tour around the UK. If you would like to share your Third Culture story, please get in touch.